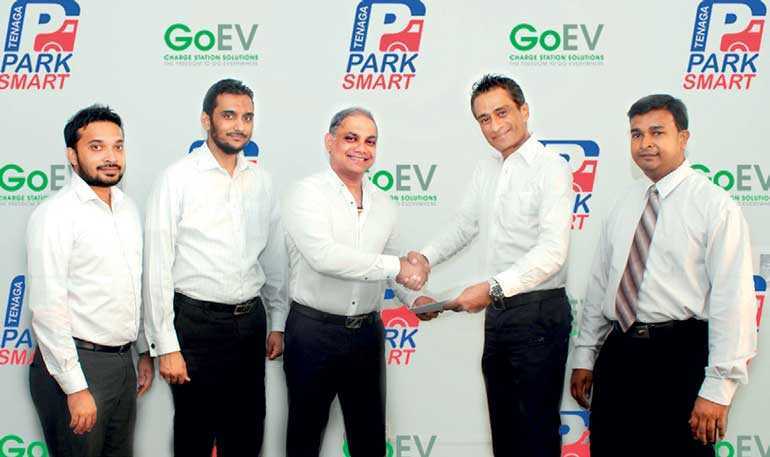 Tenaga Car Parks Ltd., South Asia’s largest parking management company, having over 100 parking meters in Colombo, collaborated with JLanka E-Mobility Ltd. to make urban life easier for electric vehicle (EV) drivers. Through this partnership, JLanka E-Mobility will deploy EV charging points in designated Tenaga parking locations. Motorists will use a single interface for both parking and charging as charging an EV would also mean parking it. What Tenaga’s Park Smart offers drivers of EVs is one single interface for convenient start, stop, and extending of charging and parking transactions. Letting charging become an integrated part of the Park Smart parking experience makes life for EV drivers easier. Keeping both charging and parking together in one user flow means there is no need for dual user interfaces and separate flows and for drivers who use the mobile app for parking, making the task so much easier. “Our vision is to make it as convenient as possible for drivers to find and pay for parking in the city. With our app, you can already start, stop and extend your parking – no matter whether you are at a meeting, in a café or shopping. Now we are looking to make it easier to be an EV driver as well, by allowing users to pay for parking and charging through just one transaction”, said Tenaga Carparks Managing Director Duminda Jayathilake. “Sri Lanka is somewhat slow in adapting to EVs, mainly due to lacking infrastructure. This initiative will contribute to the creation of a smarter and more sustainable solution that helps create a greener and a more livable city,” said JLANKA E-Mobility Business Head Sujeewa Premaratne. The user experience starts off with a registration flow, either through one of the smartphone apps, the web, or a call to the call centre. With the GPS enabled Park Smart app, motorists will be able to check the location of charging points and if they are available or not. Customers will be able to pay for their EV charging through the Park Smart app in which payment options such as eZ Cash, M-Cash, FriMi, Visa, MasterCard, and Amex are all available. Tenaga Car Parks is the pioneer in providing parking and traffic management solutions in Sri Lanka. The company has commissioned 100 solar-powered parking meters in Colombo, with an investment of Rs. 250 million, in a Public-Private-Partnership (PPP) with the Colombo Municipal Council. The parking meters have a system where once a car occupies a parking spot, owners must pay the parking fee before departing. With over 20 years of experience in industrialised countries, Tenaga has managed facilities in Malaysia and India with the help of international partners, including CALE, Gtechna and Negete (Next Generation Technologies). JLanka E-Mobility Ltd. is a new venture in redefining the mobility in Sri Lanka with new energy vehicles and infrastructure. As a subsidiary of JLanka Group, they strive to innovate and exceed the vision of the future with sustainable energy. JLanka is the market leader in PV energy in Sri Lanka with a staff strength of over 400, 14 branches and awarded with many local and international awards. JLanka is currently venturing into smart mobility, industrial automation, and intelligent energy management systems.